Cystography is a detailed study of the bladder, which uses a dye and X-rays. 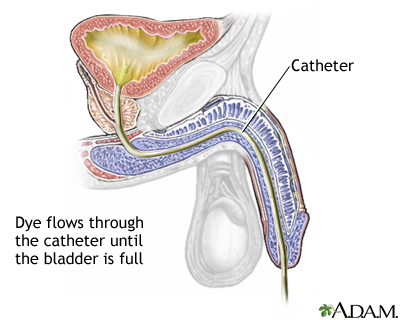 A catheter is inserted into the bladder in which the dye flows. When the bladder is full, the catheter is removed and the X-rays are taken. X-rays are also taken when the bladder is empty. The test is performed to check for the integrity of the bladder, determine the cause of infections and check for tumors or stones.